I'm still plugging away at the handquilting on my runner. I'm really, really enjoying it, despite my poor up-close eyesight these days (yep, wearing two pairs of glasses at the same time, sigh), and my sore pointer from the finger underneath the quilt that gets stabbed with each stitch. I'm also planning the last of the charm square quilts (and I had a waking dream about the design for this last charm quilt, which excites me to no end!) Unfortunately, the ivory fabric I want to use is in Kingsville, so this will get started here, and then finished back home. It's a challenge as there are only 32 squares, 30 in the pack, and I had two leftover from the first one I did. My self round robin you see peeking at the bottom of that pic is no further than when Dayna was here, but I have narrowed the appliqué pattern down to two ideas. Am I procrastinating? Uh, a little. It's that "I hope I make the right decision, gee, I don't know, ew, I don't want to trace all those shapes onto Steam-a-Seam, will it be wrong to machine-appliqué if the centre is so beautifully hand-appliquéd?" stage. I also have been really enjoying machine-quilting "Hidden in Plaid Sight". Yesterday and today I did some more lessons online in Angela Walters' "Dot to Dot Quilting" class on Craftsy and I am just LOVING this class every bit as much as her Free Motion Feathers one. Worth every cent. 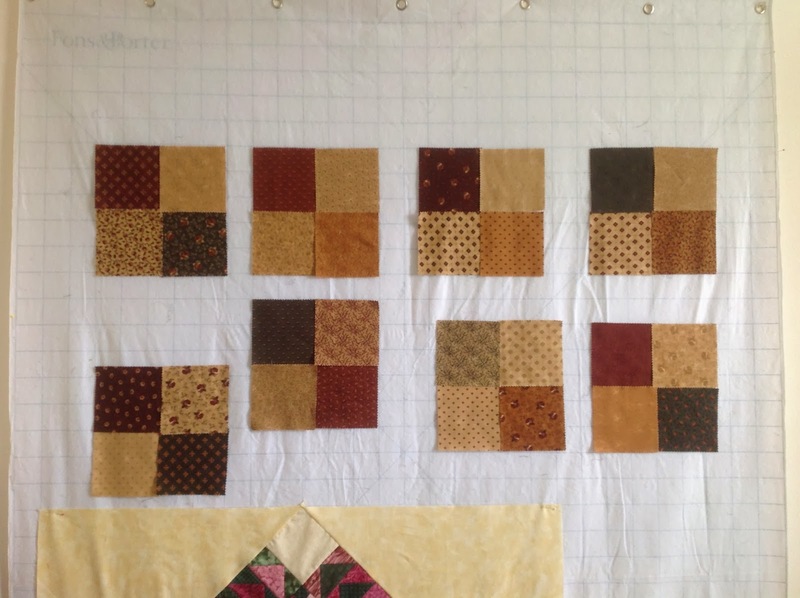 I also have her Machine Quilting Negative Space class too, and can't wait to get started on that. I must confess that I have spent more than the usual amount of time over the past couple of days, reverse-sewing, sigh. Unpicking machine-quilted stitches is no picnic. Neither is getting the window fixed in my sewing room so that it opens without having to be propped open with the can of QBS (who knew that can would have a dual purpose of 'holding'? LOL), only to discover, after I happily opened it, those 4-patches of charm squares mostly blown off!!! One of the few times I hadn't taken a picture of the arrangement...BIG sigh. I even unpicked hand-quilted stitches in the red zinger. I'd quilted a couple of feet about 1/8" away from the seam, but decided it looked weird, so unpicked it all (easy, just heartbreaking to think of the lost time that it took to stitch) and re-quilted in the ditch. I like it much better, so it was worth it. Yesterday we spent a few hours kayaking in the Robinson Preserve, along the canals and into Perico Bay. Just heavenly, so serene and calm. I'm also reading a new author, Jo Nesbø. It's The Redbreast, and is very good so far, intriguing, has me thinking on it as I sew. Hope to have some finishes shortly!